This new program, supported with a five-year grant from the Andrew W. Mellon Foundation, matches 15 students interested in the arts and humanities with local arts, cultural, and nonprofit organizations. The paid, 30-hour-per-week internships help Rochester students explore how their skills can be engaged professionally, for the good of the community. Participating organizations include the George Eastman Museum, Garth Fagan Dance, Hochstein School of Music, Memorial Art Gallery, Open Letter Books, Out Alliance, Rochester Fringe Festival, Rochester Museum and Science Center, Rochester Philharmonic Orchestra, Strong National Museum of Play, Visual Studies Workshop, Writers & Books, and local public radio station WXXI. 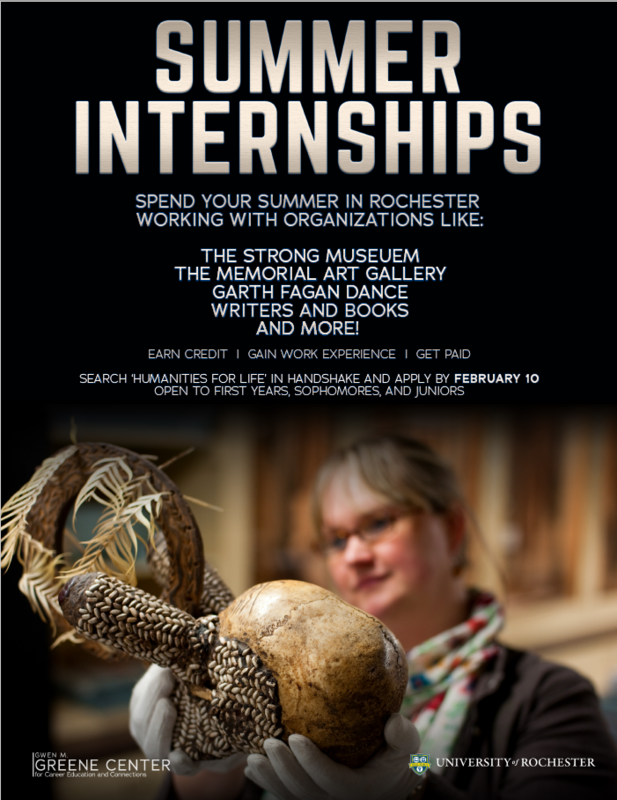 Click here to read more about the current interns and the connections they made between their projects, the Rochester community and the humanities. Students can find internship postings by searching for "Humanities for Life" in Handshake.